By using and purchasing through the Interstate Plastics website, you consent to our shipping and return policy. By using our cut-to-size service, you accept and understand that cut-to-size orders are nominal and have a tolerance of +/- 0.125" (1/8") and that non-optimal cut-to-size materials are not returnable or refundable. Cut-to-size orders include any order where cutting of a material is required and not of optimal size. Optimal sizes are returnable in new, unused condition and are generally 12x24", 24x48", 48x96" and 48x120" for sheets. Rods and tubes can only be returned in lengths of 4', 5', 8', 10' and 12'. All other lengths are considered non-optimal. Standard items and optimal sizes incur a 35% restocking fee, plus cost of freight. Please allow 24-48 hours for this order status information to become available. Orders placed for non-cut-to-size stock items typically ship within 2 working days. Cut to size orders will be subject to warehouse cutting schedules and typically ship within 3-5 business days. Travel times vary by your shipping point and destination; the average is 4 business days for non-cut-to-size items. Out of stock inventory may take 4 to 6 weeks for delivery. Accelerated shipping is available. Blue label ships in two days plus cutting time. Please contact us 888-768-5759 for details and costs. We have many shipping options and work with various carriers to deliver your order in the timeliest fashion. 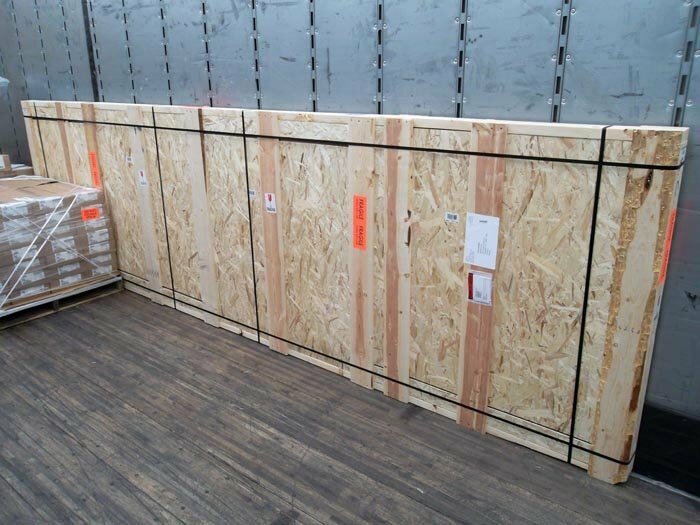 If you have a preferred method of shipping, wish to purchase additional protective packaging or have special requirements, please do not hesitate to call us at 888-768-5759. Finished plastics have a protective film or coating to prevent scratches and scuffs. Semi-finished plastics include all plastics that do not come with a protective film. Semi-finished plastics are generally machinable plastics and all non-clear plastics. Semi-finished plastics may come with scuffs and small scratches as the surface is not protected during stocking and loading. This is not considered a quality issue. If you are unsure if the material you wish to order is a finished or semi-finished plastic, please call Interstate Plastics at 888-768-5759. PLEASE INSPECT SHIPMENTS BEFORE SIGNING FOR YOUR PACKAGE -- IF THE ITEM IS DAMAGED IN TRANSIT AND UNUSABLE YOU MUST REFUSE DELIVERY TO RECEIVE A REPLACEMENT AS ALL CUT-TO-SIZE ITEMS ARE NON-RETURNABLE. FOR DAMAGED ITEMS YOU MUST CONTACT AND MAKE A CLAIM WITH UPS WITHIN 7 DAYS FROM RECEIPT OF DELIVERY DATE. PLEASE GIVE THE CLAIM NUMBER PROVIDED BY UPS TO AN INTERSTATE PLASTICS REPRESENTATIVE AT (888) 768-5759 SO THAT THE ISSUE CAN BE FURTHER EXAMINED AND THE APPROPRIATE ACTIONS TAKEN. If your item is damaged beyond use, give Interstate Plastics a call at 888-768-5759 and provide details about the damage to your item. You'll also have the opportunity to tell us if you wish to request a refund or receive a replacement item. Contact us for mandatory authorization number. ISO requirements allow no exceptions. Credit cannot be issued until product is received and inspected in our facility. By using our cut-to-size service, you accept and understand that cuts are nominal and have a tolerance of +/- 0.125" (1/8"). At checkout you are required to input if the shipment is going to a residential or commercial addresses. ALL LOCATIONS THAT DO NOT HAVE A LOADING DOCK AND FORKLIFT ARE CONSIDERED RESIDENTIAL ADDRESSES. RESIDENTIAL SHIPMENTS MUST BE SHIPPED ON DIFFERENT CARRIERS. NEGLECTING TO INPUT THAT SHIPMENT IS TO A RESIDENTIAL ADDRESS MAY RESULT IN THE INABILITY TO DELIVER. NO SHIPPING REFUNDS WILL BE PROVIDED IF THE CUSTOMER NEGLECTS TO INPUT THAT SHIPMENT IS TO A RESIDENTIAL ADDRESS. If the location of delivery has a loading dock and forklift, it is a commercial address and there is no need to select the residential address check box during checkout. Domestic shipments will normally ship UPS, as UPS is Interstate Plastics' preferred carrier. Customers who have accounts with other shipping carriers may choose to ship on their own account. USPS may be used for smaller sheet sizes (typically under 12x12") and accessory items. Due to feasibility, Interstate Plastics is limited to size and weight limits dictated by USPS standard flat-rate priority mail boxes. PLEASE CALL INTERSTATE PLASTICS AT 888-768-5759 TO REQUEST USING YOUR OWN CARRIER. ONLINE ORDERS WILL HAVE SHIPPING REFUNDED IF A REQUEST TO USE YOUR OWN CARRIER IS MADE AFTER THE ORDER HAS BEEN PLACED. International shipments can only be shipped through UPS or USPS, unless otherwise specified by the customer to use their account. Our shipping through USPS is limited to flat rate boxes. Please call 888-768-5759 if you wish to use your own shipping account. NO HAZARDOUS MATERIALS WILL BE SHIPPED INTERNATIONALLY. Available products, shipping rates and fees vary depending on the delivery address for your order. Your packages may be subject to customs fees and import duties of the country to which your order ships. These charges are the recipient's responsibility. Please call 888-768-5759 for rates to your country. Freight (non-parcel) orders are case by case but many times we are able to ship only to a freight forwarder. 4x8' - $120 crating charge. 4x12' - $180 crating charge. 4x16' - $240 crating charge. 4x24' - $360 crating charge. Standard stock and optimal size items are returnable if undamaged and in unused, new condition. Items will be inspected to ensure the item is in new condition; credit cannot be issued until product is received and inspected in our facility. Cut-to-size, machined and non-standard items are not returnable or refundable. If we cut it, you own it! Cut-to-size products include any material that is cut below its standard sheet length or optimal size. Full sheet sizes are normally 4'x8' or 4'x12'. Optimal sizes generally include 12x24", 24x48", 48x96" and 48x120" for sheets. Rods and tubes can only be returned in lengths of 4', 5', 8', 10' and 12'. All other lengths are considered non-optimal. If you are unsure of full or optimal sheet size, please contact our customer service staff at 888-768-5759. PLEASE INSPECT SHIPMENTS BEFORE SIGNING FOR YOUR PACKAGE -- IF ITEM IS DAMAGED YOU MUST REFUSE DELIVERY TO RECEIVE A REPLACEMENT AS ALL CUT-TO-SIZE ITEMS ARE NOT RETURNABLE OR REFUNDABLE. FOR DAMAGED ITEMS YOU MUST CONTACT AND MAKE A CLAIM WITH UPS WITHIN 7 DAYS FROM RECEIPT OF DELIVERY DATE. PLEASE GIVE THE CLAIM NUMBER PROVIDED BY UPS TO AN INTERSTATE PLASTICS REPRESENTATIVE AT (888) 768-5759 SO THAT THE ISSUE CAN BE FURTHER EXAMINED AND THE APPROPRIATE ACTIONS TAKEN. • Semi-finished plastics may come with scuffs and small scratches as the surface is not protected during stocking and loading. This is not considered a quality issue. Semi-finished plastics include all machinable plastics without protective masking. • Adhesives and any hazardous materials are not returnable or refundable and all adhesive and hazardous material sales are final. All adhesives ship from our certified location in Sacramento. No overnight shipping or air freight will be provided for hazardous material shipping. • Returned items must be in new and unused condition. Tools, welding tools, blades, drills, bits, sample packs and all accessory items will be inspected to ensure the item is in new condition. Items must be returned with all original packaging and/or accessories. Individual samples are non-refundable. • Contact us for mandatory authorization number. ISO requirements allow no exceptions. Credit cannot be issued until product is received and inspected in our facility. • Standard Items incur a 35% restocking fee, plus cost of freight. Quality issues are exempt from fees. • Custom cuts and fabricated parts are not returnable or refundable. Cut-to-size orders have an acceptable cut tolerance of 1/8" (0.125"). WARNING: Due to shipping restrictions on certain adhesives, you may be required to purchase a minimum of one full case. Various adhesive types and sizes contain different quantities. Please give us a call for full case minimums. The U.S. Department of Transportation, publishes Title 49 CFR (Code of Federal Regulations) which regulates transportation of hazardous materials by road, rail, sea and air.